Wanted by the law...marked by the lawless...betrayed by his best friend...but you can't stop a Texan while there's a song on his lips...and lead slugs in his six guns! Tex (Tex Ritter) and his friend Slim (Slim Andrews) go undercover to help Jane Winters (Terry Walker) keep her Stage line running as Mr. Storm and his gang slowly pick it apart in order to take over her business. Jane has already had all of her Stage Coaches destroyed except one. 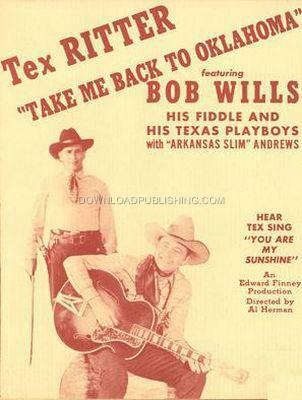 Tex gets hired as a Stage Coach Driver and when he sees that he needs help he calls in his friends, Bob Wills and the Texas Playboys, a country music band, who also do a concert for charity.